Indian philosophy has in recent years had a deep and growing fascination for many minds, though up to the present time its exponents in this country have been entirely Western in their thought and training, with the result that very little is really known of the deeper mysteries of the Vedanta wisdom, and that little only by a select few. Not many have the courage or the intuition to seek in heavy translations, made greatly in the interests of philologists, for that sublime knowledge which they really reveal to an able exponent brought up in all the traditions of the East. It was therefore with interest and not without some curiosity, writes a correspondent, that I proceeded to interview an exponent entirely novel to Western people in the person of the Swami Vivekananda, an actual Indian Yogi, who has boldly undertaken to visit the Western world to expound the traditional teaching which has been ended down by ascetics and Yogis through many ages and who In pursuance of this object, delivered a lecture last night in the Princes' Hall. The Swami Vivekananda is a striking figure with his turban (or mitre-shaped black cloth cap) and his calm but kindly features. On my inquiring as to the significance, if any, of his name, the Swami said: "Of the name by which I am now known (Swami Vivekananda), the first word is descriptive of a Sannyâsin, or one who formally renounces the world, and the second is the title I assumed — as is customary with all Sannyasins — on my renunciation of the world, it signifies, literally, 'the bliss of discrimination'." "And what induced you to forsake the ordinary course of the world, Swami?" I asked. "I had a deep interest in religion and philosophy from my childhood," he replied, "and our books teach renunciation as the highest ideal to which man can aspire. It only needed the meeting with a great Teacher — Ramakrishna Paramahamsa — to kindle in me the final determination to follow the path he himself had trod, as in him I found my highest ideal realised." "Then did he found a sect, which you now represent?" "No", replied the Swami quickly. "No, his whole life was spent in breaking down the barriers of sectarianism and dogma. He formed no sect. Quite the reverse. He advocated and strove to establish absolute freedom of thought. He was a great Yogi." "Then you are connected with no society or sect in this country? 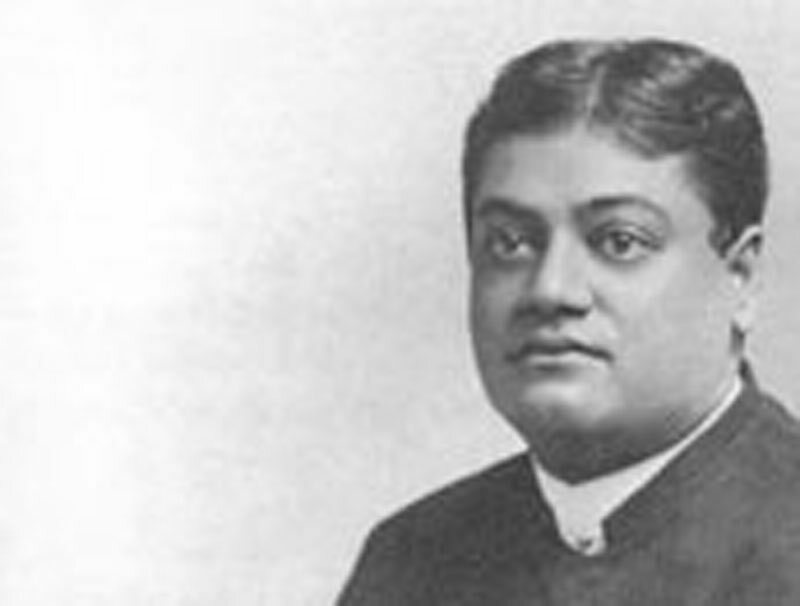 Neither Theosophical nor Christian Scientist, nor any other?" "None whatever!" said the Swami in clear and impressive tones. (His face lights up like that of a child, it is so simple, straightforward and honest.) "My teaching is my own interpretation of our ancient books, in the light which my Master shed upon them. I claim no supernatural authority. Whatever in my teaching may appeal to the highest intelligence and be accepted by thinking men, the adoption of that will be my reward." "All religions", he continued, "have for their object the teaching either of devotion, knowledge, or Yoga, in a concrete form. Now, the philosophy of Vedanta is the abstract science which embraces all these methods, and this it is that I teach, leaving each one to apply it to his own concrete form. I refer each individual to his own experiences, and where reference is made to books, the latter are procurable, and may be studied by each one for himself. Above all, I teach no authority proceeding from hidden beings speaking through visible agents, any more than I claim learning from hidden books or manuscripts. I am the exponent of no occult societies, nor do I believe that good can come of such bodies. Truth stands on its own authority, and truth can bear the light of day." "Then you do not propose to form any society. Swami?" I suggested. "None; no society whatever. I teach only the Self hidden in the heart of every individual and common to all. A handful of strong men knowing that Self and living in Its light would revolutionise the world, even today, as has been the case by single strong men before each in his day." "Have you just arrived from India?" I inquired — for the Swami is suggestive of Eastern suns. "No," he replied, "I represented the Hindu religion at the Parliament of Religions held at Chicago in 1893. Since then I have been travelling and lecturing in the United States. The American people have proved most interested audiences and sympathetic friends, and my work there has so taken root that I must shortly return to that country." "And what is your attitude towards the Western religions, Swami?" "I propound a philosophy which can serve as a basis to every possible religious system in the world, and my attitude towards all of them is one of extreme sympathy — my teaching is antagonistic to none. I direct my attention to the individual, to make him strong, to teach him that he himself is divine, and I call upon men to make themselves conscious of this divinity within. That is really the ideal — conscious or unconscious — of every religion." "And what shape will your activities take in this country?" "My hope is to imbue individuals with the teachings to which I have referred, and to encourage them to express these to others in their own way; let them modify them as they will; I do not teach them as dogmas; truth at length must inevitably prevail. "The actual machinery through which I work is in the hands of one or two friends. On October 22, they have arranged for me to deliver an address to a British audience at Princes' Hall, Piccadilly, at 8-30 p.m. The event is being advertised. The subject will be on the key of my philosophy — 'Self-Knowledge'. Afterwards I am prepared to follow any course that opens — to attend meetings in people's drawing-rooms or elsewhere, to answer letters, or discuss personally. In a mercenary age I may venture to remark that none of my activities are undertaken for a pecuniary reward." I then took my leave from one of the most original of men that I have had the honour of meeting.